Today I am linking up with Doodle Bugs Teaching for the Five For Friday where I share 5 random things about today or this past week. Click on the button above to read more Five For Friday posts. 1. I am a Southern Louisiana girl and today I had boiled crawfish for the first time this season (crawfish are only harvested a few months out the year). They were amazing! Click on the picture to visit a blog dedicated to crawfish cuisine in Louisiana. This was my serving tonight. 2. We gave a puppy a home! This darling "weenie dog" (as my boys call him) is the newest addition to our family. He is sweet and a handful all at the same time. 3. Now to the classroom (enough about my personal life). This week I did some winter assessments to look at my students reading and comprehension. I have been using a wonderful website this year to assist in Reading and ELA. Learning A-Z is a wonderful program that helps to fill gaps in Reading, Writing, and Science programs. This week in particular I used Reading A-Z's leveled reading comprehension, phonics, and fluency assessments in order to get a more accurate picture of my students strengths and weaknesses. All resources are aligned to the Common Core State Standards and Fountas & Pinnell guided reading levels. They offer a 7 day free trial which allows you an all access pass to their resources. I highly recommend that you check it out if you are in need of "filling" gaps in the areas of Reading, Writing, and/or Science. Click on the picture below to visit their website and find out more information. The sorting mats with addition cards has been a very popular center this week. It also comes with a recording sheet which helps me keep track of students who are still struggling in a time effective way. This printable worked great for higher order thinking. I had students create their own story problems. You can grab your free copy of this printable by clicking the picture above and downloading from Google Docs. ***This freebie is not available in my TpT store-only to those who read this post. This is a preview of the entire set for sale in my store. Click on the picture above for more information. 5. And finally I would like to share my Friday FREEBIE. Every Friday on my blog I give away a new FREEBIE. Here is the one I offered this week. The post is all about sight words and a great product that I am working on. I hope you enjoy. 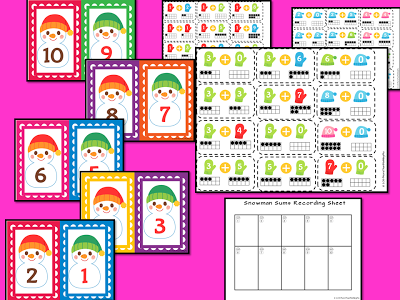 Click on the picture to head over to that post and get your copy of my Sight Word FREEBIE! I want to thank Doodle Bugs Teaching for hosting this wonderful linky party. And you for reading my post. Feel free to leave comments-I love hearing what you guys think. If you want to be a part of my Friday FREEBIES every week, look in the left hand margin and join my other followers. Thanks for stopping by and I hope you have a wonderful weekend. Welcome! I'm glad you like the freebie. Thanks for linking, I liked reading your blog. I have a little red miniature dachshund named Hundley (like on Curious George) and we love him. He is ornery and raids the trash on a regular basis! I hope you enjoy your dachshund as much we love ours! Thanks for stopping by. I'm sure I will have many more stories to share with the new puppy. Thanks for sharing about yours-love the name! Yes I linked too. It looks like a great Linky party!